Burgon & Ball Shears. Unlike other hand shears, the handle is bent 15º. Easy to maneuver in tight areas. Used for trimming sheep and general use. Used as dagging shears overseas, but many prefer them for trimming and general use. 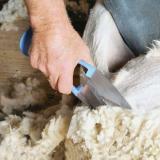 Use a Hand Shear Protector, sold separately, to protect and safely store your shears. 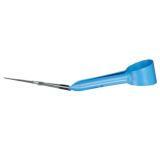 Gives you a different angle for reaching difficult areas, creating less hand strain. 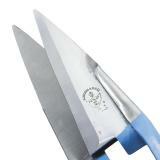 To resharpen your hand shears, use Premier's resharpening service. Only $7/each. Use item #869100. Constructed of thick, rugged leather to protect and safely store shears. 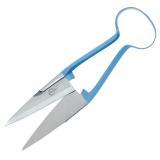 This is the first pair of hand shears I've purchased, although I have used and borrowed multiple other hand shears. I use them to trim excess hair on my Dorper/Katahdin herd and they do great, many of the sheep are skittish from the electric shears I would previously rent. Takes longer but it never malfunctions or overheats like some electric shears. I bought these shears to trim off the small amount of hair that doesn't fall off the Black Belly sheep I own, They work great. They are light weight, easy to use, and ,best of all, portable. I can use them in the barn or out in the field. 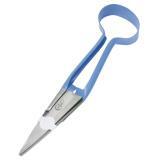 I highly recommend these shears to everyone. We don't have power at the barn and our pet Dopper doesn't completely shed so I got these to finish the job and they work great. I bought these mainly for trimming off any excess hair on our Katahdin sheep to reduce fly strike or better treat fly strike. We only have 20 sheep so this was most cost effective. They work well and are easy to maneuver around the entire sheep. Very sharp, so be careful! I didn't experience hand fatigue but if you were going to use them for entire sheep trimming for a herd I would recommend electric vs these manual ones. This is my second pair. 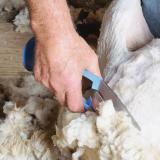 I have used the first pair for nine years, hand shearing a flock of 30 ewes. I love the way the bent handle allows me to follow the natural body lines.